← I DO… believe in gay marriage. 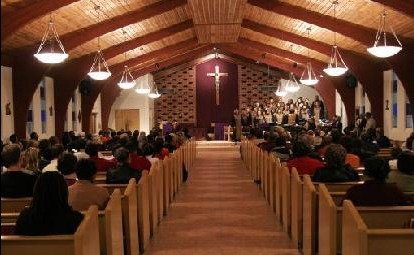 My church….standing in the light. In Connecticut this morning, post-wedding, and heading for New York City to see my father-in-law and Lulu. Yesterday’s wedding was glorious, the day sunny and perfect, and everybody blissfully happy. Today is cloudy and chilly and perfect for snuggling in. Happy Sunday wherever you are! I love OLOL so much, it’s ridiculous. It’s small, it’s mighty, it has awesome music (thanks to our Minister of Music and chair of Spelman College’s Department of Music, Dr. Kevin Johnson), and it’s got our brand-new pastor: Father Jeffery Ott, a Dominican friar from New Orleans, and our new Assistant Pastor Father Bruce Schultz … not to mention our affable, groovy deacon, Chester Griffin (whose beautiful wife Janis also leads the choir), a liturgical dance company called Amazing Grace, and some highly gifted & competitive sports teams (of which I’m not a member). I’m not sure if you know many Catholics, but I can tell you for sure, we’re not the monolithic, homogenized, “jump to the Pope’s every proclamation” pack of lemmings that you may think. I, for one, believe that the church’s stance on birth control is socially irresponsible, morally insupportable, and just plain nuts. But I also think the church’s position on poverty, social responsibility, gun control, the death penalty, immigration, health care, equality, civil rights, justice, peace, and charity is truly inspired.